Conor Skehan said that families may be “gaming the system” in order to jump up the social housing waiting list. CHARITY OFFICIALS AND opposition politicians have strongly criticised the outgoing chair of the Housing Agency over comments he made saying that families may be “gaming the system” by making themselves homeless in order to jump up the social housing waiting list. 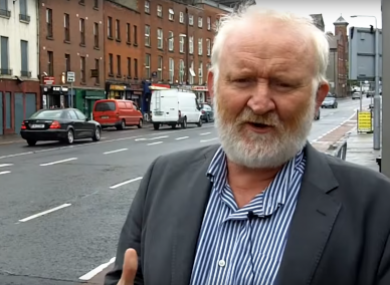 Speaking to the Irish Times, Conor Skehan – who will finish up with his role this year after five years - suggested that the government may have “unwittingly created a problem by prioritising self-declared homelessness above all other types of housing need”. Skehan referenced a measure – introduced in January 2015 – whereby 50% of all social housing allocations in Dublin were to go to homeless people. This practice was discontinued in July 2016, due to fears that general applicants were being disadvantaged. Dublin City Council still prioritises homeless applicants, however. Commenting on this measure, Skehan suggested that the prioritisation could be skewing homelessness figures. “We unwittingly created a problem by prioritising self-declared homelessness above all other types of housing need, which created a distortion in the waiting list system and may have encouraged people to game the system,” he told the Irish Times. He said that a way of gauging this was to look at if there was a change in the type of people presenting as homeless over the period that prioritisation has been in effect. “If you were a social scientist analysing it, you might find people who had chaotic lives suddenly being displaced by people who had two or three kids and who have found a way of gaming the system,” said Skehan. In the interview, Skehan also suggested that homelessness charities should be subject to “performance targets” to justify any state funding they receive. He also said that it was time to stop saying that homelessness can be ended. The Housing Agency was set up in 2010 and plays a crucial role in addressing housing issues in the state. Skehan has been strongly criticised for his comments, with homelessness experts and others saying that there was no evidence for the claims that families were “gaming the system”. “Conor Skeehan’s comments accusing some homeless families as ‘gaming the system’ are deeply hurtful to the thousands of people living in emergency accommodation,” said Sinn Féin TD Eoin Ó Broin. They are also not based on any evidence. Ó Broin pointed towards an April 2016 report from the Housing Agency which examined the impact of the 50% social housing allocation and which failed to show any evidence to back up Skehan’s remarks. The report – which can be viewed here – suggested that there might be potential for “perverse incentive” created by the 50% allocation measure. It suggested that there was “emerging evidence” that families presenting as homeless might be expecting to be housed in social housing “after a very short period of waiting”. However, the report does not specify what this evidence is, and no reports on this practice occurring have been released since. “There is no evidence for this happening,” said Mike Allen, director of advocacy with homelessness charity Focus Ireland. “And it’s not as though there is no evidence so it might be happening… If this was happening there would be evidence for it. If you look at the graph of homelessness at that time, it doesn’t start to go up any faster. It continues to go up at the same speed. Skehan has come under fire in the past - most recently last November - when he said that homelessness was “a normal thing”. Allen said that Skehan’s comments today and in the past had “done an awful lot of damage” to the debate around homelessness. In his time as chair of the Housing Agency, Allen said that Skehan had “learnt remarkably little about homelessness”. Allen pointed to the example of Finland – which has all but eliminated long-term homelessness – as contradicting Skehan’s claims that homelessness could not be ended. He also said that Focus Ireland and other charities are subject to strict performance targets over a large number of their state-funded activities. Ó Broin called for Housing Minister Eoghan Murphy to disassociate himself from Skehan’s comments. Latest figures for Ireland show that there were 1,530 homeless families with 3,333 children staying in emergency accommodation in November. This is almost a 400% rise in the number of homeless children in three years. When questioned over Skehan’s comments and the criticism directed at him, a Housing Agency spokesperson said they would not be commenting. FactCheck: Does Ireland really have a low rate of homelessness by international standards? Email “'No evidence whatsoever' to claims by top housing official that homeless families are 'gaming the system'”. Feedback on “'No evidence whatsoever' to claims by top housing official that homeless families are 'gaming the system'”.